Walking your dog can sometimes be a joy, and other times be a hassle…and walking two dogs at once can really be a struggle! Dogs going in different directions can lead to tangled leashes for them and twisted wrists for you. With your hands full of leash handles, how do you carry poopy bags, treats, and a flashlight for nighttime walks? Now there’s a solution to all of these problems and more! Discover how the Dog Gone Smart I’m Gismo Multi-Function Leash Holder will help take the stress out of walking your dog(s) and make you look like the smartest pet parent on the block. Dogs love routine, so keeping a daily walk schedule when possible will help ease stress and give your pet something to look forward to. Morning walks are essential. They are a good way for you to get your circulation going before a day of work while letting your dog “empty out” to cut down on household accidents while you’re away. Getting exercise in the morning also helps relieve anxiety some dogs may feel when alone in the home. Walking your dog in the evening after dinner is a great way for you both to burn off those late day calories and earn a sound night’s sleep. Just make sure you carry a flashlight and wear brightly colored clothing so you can be seen by passing drivers. Daily walks are also the ideal time to train your dog to improve social behavior, obedience, and self-control. There will be many new things to encounter and places to explore, but your dog may not always react to stimuli in the environment in a way that’s safe and socially acceptable. Using a clicker followed each time with a treat can help reinforce good behavior and train your dog to handle challenging situations in an appropriate manner. Remaining patient and in command will help you and your dog handle any situation that you face. Using the opportunities that come up as a learning experience, such as meeting other dogs and people, will help improve your pet’s behavior with each walk. Leash pulling – Does your dog constantly pull on the leash, making it feel like you’re the one being taken for a walk? 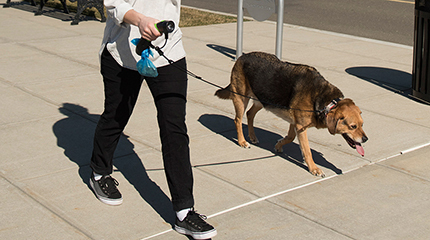 Leash pulling puts you at risk for painful leash burns on your hands and/or a twisted wrist. You may want to try the Thunderleash. It’s designed to be used either as a simple, standard leash or as a harness, which can help minimize pulling. Feces eating – To their pet parents’ dismay, some dogs may eat their own excrement (or that of other animals). There are a number of reasons for this, one of which may be a nutritional imbalance. Regardless, this is a habit most of us would want to discourage. Making sure your dog is getting enough vitamins and nutrients in his or her diet is the first step. For extreme cases, try FOR-BID, which safely discourages dogs from eating their own feces. Of course, picking up the poop with a poopy bag before your dog has a chance to get at it can help, too. Arthritis & joint problems – If your dog experiences joint pain and inflammation, it may be difficult to get him or her to go on that all-important daily walk. Dogs who don’t get enough exercise are at risk of weight gain, which can further impact joint problems. Giving your pet joint supplements is a safe and healthy way to protect joints and support healthy cartilage. If your dog experiences pain from arthritis, your vet may prescribe pain relief medications to help your dog enjoy an active lifestyle. Excessive barking – Barking, whether at other dogs or people, can make walking your dog stressful. If this is a problem, consider using a Bark Genie hand-held bark controller to help discourage inappropriate barking. The Dog Gone Smart I’m Gismo Multi-Function Leash Holder was developed to be a pet parent’s second best friend. Along with the proprietary attachments, this dog-walking system puts everything you need for the ideal dog walk in the palm of your hand. The ergonomic design and soft, comfort grip handle saves your hand from the twisting and abrasion conventional leash handles often cause. The attached carabiner holds any leash, allowing for sliding and swiveling action to let your pet move freely without tugging or twisting your hand. The main handle unit also comes with an attachable poop bag dispenser and roll of poop bags. The dispenser has a built-in clip so you can carry full poop bags hands-free. There are 3 optional attachments for the Dog Gone Smart I’m Gismo Multi-Function Leash Holder that expand its functionality even more. The optional Dual Leash Holder Attachment allows for the comfortable walking of two dogs at once! Now, with just one hand, you can walk two dogs without the worry of tangled leashes and two leash handles chaffing your hand. You’ll have better control over your pets while still having one hand free to carry your phone or water bottle. The rechargeable LED Flashlight Attachment shines a bright beam of light to make nighttime walks safer. The flashlight has two light settings: a bright, steady beam or a blinking beam for added visibility. The flashlight easily connects to the top of the handle and is controlled by the handle’s built-in multi-function button. When turned on, a ring of light also shines from the back of the handle so you can be seen from behind. The flashlight attachment comes with a USB cord for convenient charging. The Training Kit Attachment comes with a spring-closing treat dispenser and a training clicker that is controllable with the handle’s multi-function button. The treat dispenser is top-rack dishwasher safe for easy cleaning. The spring closing doors allow you to quickly access the treats so you can time your reward just right. No need to fumble around opening packages or plastic bags. Win a FREE Dog Gone Smart I’m Gismo Multi-Function Leash Holder ! Do you and your pet need a Dog Gone Smart I’m Gismo Multi-Function Leash Holder with accessories? Just leave a comment below for a chance to win a FREE Dog Gone Smart I’m Gismo Multi-Function Leash Holder with accessories from 1800PetMeds! One winner will be chosen at random, so everyone who participates has a chance to win! (Limited to residents of the U.S.) The winner will be announced on Monday, August 7, 2017! Good luck! Congrats to the drawing winner, Cassandra! We’ll send you an email with details about claiming your prize. It would help since we have 2 dogs. I only have 1 Lab now but with us always fostering Labs for our rescue group, we frequently have multiple dogs that all need lots of walks to burn off all that energy. The “leash limbo” can get crazy with 3 or more dogs and this would really help with those dogs that need walks late at night too. This would be great for me and my dogs , as I have to hold 2 of the retractable leashes and they’re always getting tangled up or they are pulling my arms apart. i would really like to have one of these. And at night time the flashlight would come in handy to see where to pick up the poop, since i live in an apartment.